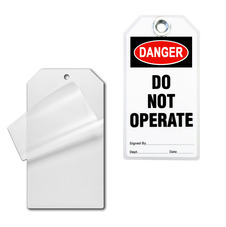 Make your own safety tags using these durable, tag-shaped, clear plastic laminating pouches. Use the drop-down and choose glossy finish 2 sides, or matte finish one side or 2 sides. If you want to add a standard 3/8" grommet, please select 7/16" hole size. 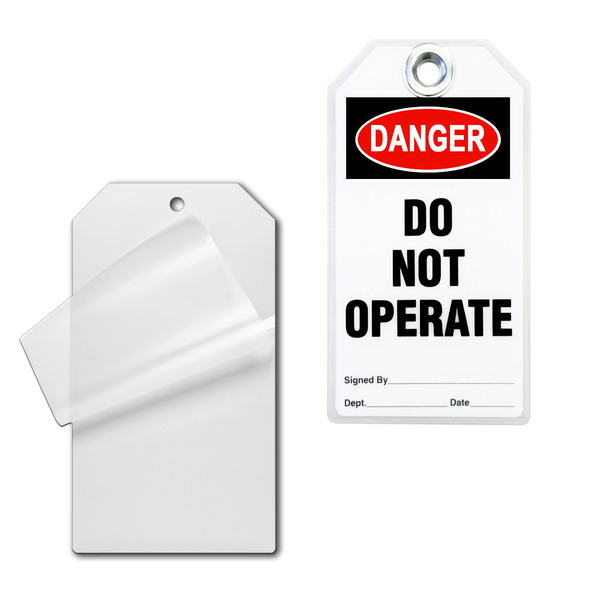 Use our Q-Tag® Laminating Pouches when you want to imprint or attach an operator's photo to a safety tag, or when you wish to customize a tag and then seal it in durable plastic for long term notice or lockout situations. These Q-Tag® Laminating Pouches are used with our Paper Q-Tag® Inserts, DIY Photo ID Safety Tags or with any paper tag of your choice. 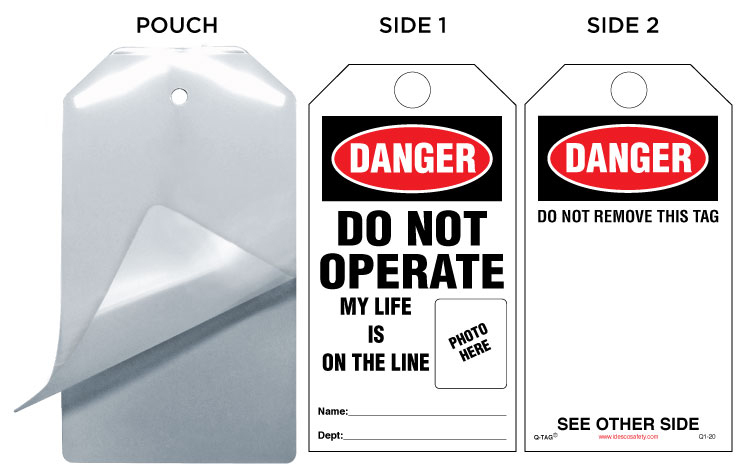 Can I choose the type of finish and which sides with these Q-Tag Laminating Pouches? Absolutely! We understand that standard operating procedures are unique from organization to organization. We allow you to choose between a one or two side glossy finish or a 1 or 2 side matte finish. I’d like to add a standard grommet to the tag once completed. Are your tags compatible with the ⅜” grommet? If you would like to add your standard ⅜” grommet, then you will want to choose the 7/16” hole size. This will allow you to add the grommet for added pull strength and protection. Do I have to use your Q-Tag paper inserts with this particular set of laminating pouches? You certainly can use our Q-Tag paper inserts and we think you should as they are the perfect compliment. 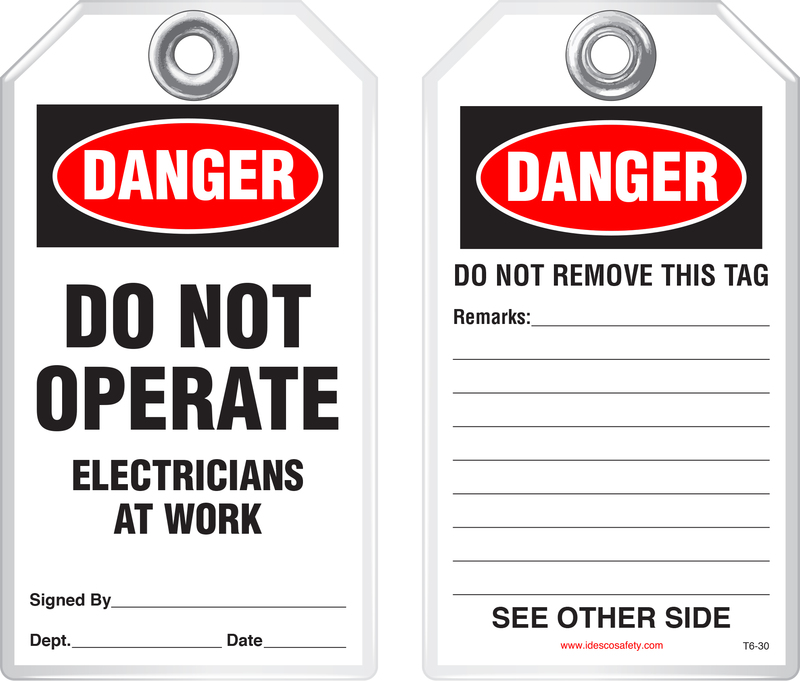 However, you can use any DIY safety tags that fit within side the lamination. What is the pull strength of these tags and do they meet OSHA requirements? 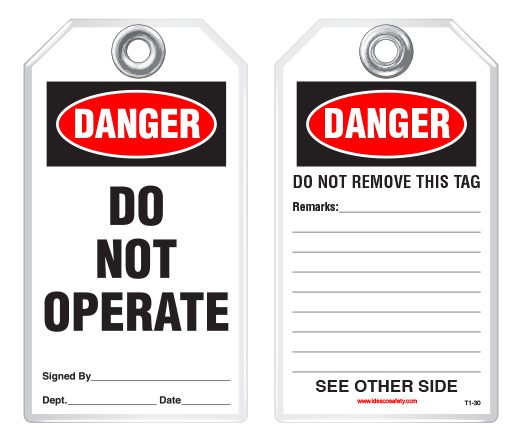 The pull strength of these tags reached 80 pounds which far exceeds the OSHA recommended 50 pound pull strength.